The airborne invasion of Crete took place during WWII when German paratroopers landed at Maleme Airport near Chania. and missing in the assault. - 11:00a.m. 5th Cretan Division at Kolimbari . - 10:00 a.m. Doxology at Metropolitan Church in Chania . - 11:00 a.m. Firkas Fortress Flag Raising by Maritime Museum . 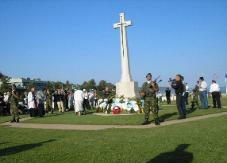 - 13:00 Ceremony at the German War Cemetery , at Maleme . -12.30 Memorial New Zealand - Australian ANZAC at 42nd Tsikaliaria St..
- 18:30 Closing Ceremony at Maleme Airfield - Battle of Crete monument. 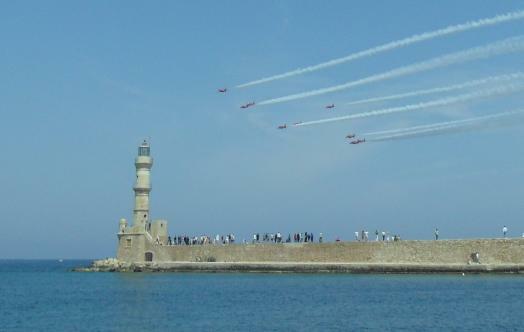 Above: RAF Red Arrows display over Chania Harbour May 22nd 2011 marking the 70th Anniversary of the Battle of Crete.